After a bit of hanging around by the salesman’s desk (where he was sitting reading something or other), he reluctantly decides to ask if I need assistance. Yes, I say, I am looking for a hard-wearing hall carpet with a slight blue stripe in it. Oh my gosh, I might as well have asked for a carpet made from solid gold. Tut, tut, tut, he says, shaking his head, you’d be hard-pressed to find a carpet with a blue stripe; there’s not much call for that kind of thing. And thus commences one of the most negative sales encounters I’ve experienced for a while. I may not be a carpet expert, but I know what I want. I also know, from having looked around the Net and my local carpet store (a tad expensive) that there are plenty of striped carpets around with a hint of a blue stripe. But even if there weren’t, I would expect, as a customer, to receive a professional welcome. Instead I was made to feel as if I were a silly woman asking for something ridiculous. And, oh it just seemed like too much hard work for him to offer friendly customer service. OK, so maybe he was having trouble at home. Maybe his goldfish had died. But, in this day and age – or indeed any day and age – it pays to offer the best possible customer service. Nothing should be too much trouble. So I think it’ll have to be our local carpet store. Even though they are fairly expensive, they’re nice, friendly, helpful people. 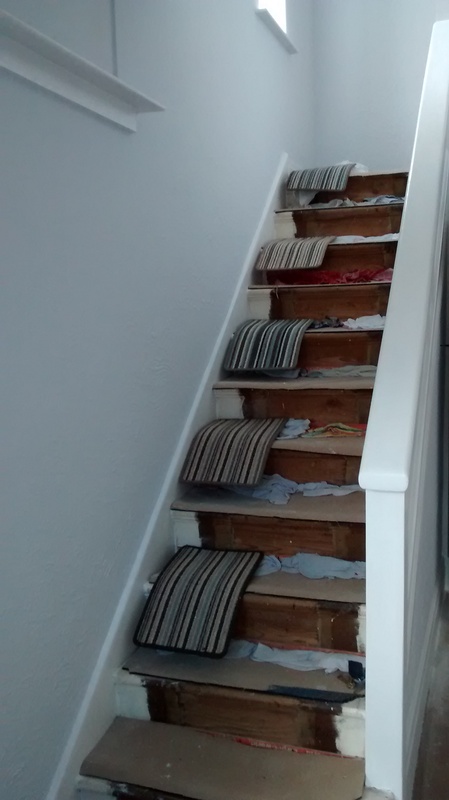 And, as you can see from the photo of our staircase above, they stock plenty of striped carpet with a hint of blue! ← Why was my car being hijacked by copywriting asylum seekers?